My husband loves blueberries and I love coconut… so this was my creation of blending the two together. I had no idea how it was going to turn out. But I have to say it is AMAZING and a new family favorite for sure. The cake is light and moist and the fresh berries are both tart and sweet all at the same time. While the crumble topping adds the perfect finishing touch… just trust me your family will love it. Combine flour, baking powder and salt, mix in a bowl and set aside. You will also want to grease a 9X9 pan and set it aside as well. Preheat your oven to 350 degrees. In another bowl blend the butter, egg, sour cream, milk and sugar once it is well blended stir in the dry ingredients. Stir until smooth. Pour batter into your prepared 9×9 pan, smooth out into an even layer. Sprinkle the blueberries on top. 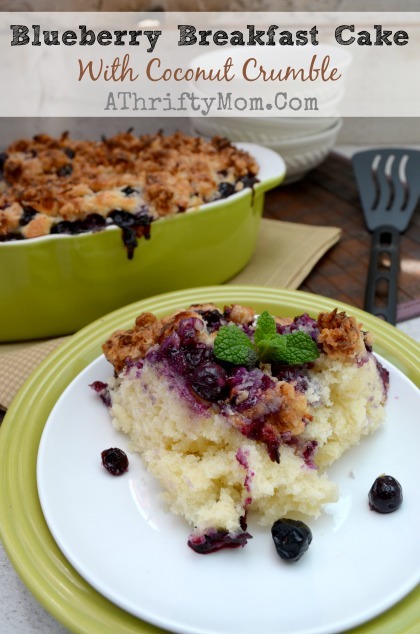 In another bowl combine the topping ingredients, mix well and then crumble on top of the blueberry layer. Place in a preheated oven at 350 degrees and bake for 50-60 minutes till top is golden brown and fork comes out clean when poked into the middle of the cake. Yay, it’s working now! It looks delicious.